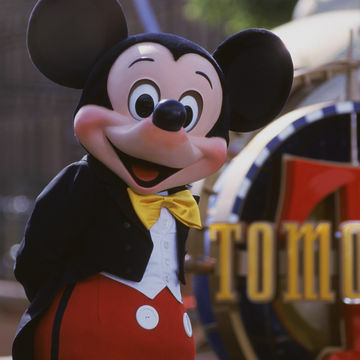 The measles outbreak that started at California's Disneyland is spreading rapidly. Here's the risk the outbreak—and others like it—can pose for your baby. New moms worry about a lot of things: Is my baby eating enough? Why won't she sleep? Is this much poop normal?! But "Could she have measles?" isn't something we've had to ask...until now. A Disneyland measles outbreak has resulted in more than 60 confirmed cases, which have branched out beyond theme park visitors and throughout multiple states and Mexico, according to the California Department of Public Health. Measles is one of the most contagious viruses in existence, spreading easily through air or via infected surfaces. Symptoms include fever, dry cough, runny nose, red and watery eyes, white spots in the mouth and a telltale splotchy red rash. In rare cases, it can cause deafness or mental retardation; of every 1,000 people who contract measles, one or two will die. The bad news: Infants under the age of one, who are too young to receive the measles, mumps and rubella (MMR) vaccine, are at highest risk, along with children who are unvaccinated. The good news: When administered (first at age 12-15 months and again at 4-6 years), the shot is safe and effective. Do it for your baby—and your community. Babies, medically-compromised individuals and the elderly depend on something called herd immunity to stay healthy. When most community members (i.e. the herd) are vaccinated, it's trickier for an outbreak to occur. The Centers for Disease Control and Prevention (CDC), the AAP and other medical groups release a vaccine schedule each year. Talk to your pediatrician to make sure that your baby stays up-to-date and gets her vaccines at the recommended age. Delays can expose your child to dangerous illnesses. If you suspect you or your baby may have been exposed to the measles, talk to your baby's doctor. In very high-risk outbreak situations, a doctor may recommend giving the MMR vaccine to a baby earlier, as young as 6 months, according to the CDC. Adults who are unsure of their immunity status and may have been exposed should get vaccinated as soon as possible; if it's within 72 hours of the exposure, they'll benefit from added protection against the current risk. Make sure you're immune before you conceive. While the data on whether measles can cause birth defects in a fetus is unclear, there is an increased miscarriage risk if a woman contracts measles in the first trimester. And a Rubella (also known as German measles) infection in pregnancy can have serious lifelong consequences for an unborn child. Chances are you received your two MMR doses as a child and are immune, but it's wise to confirm: Ask your ob/gyn for a pre-pregnancy blood test to verify your immunity. If you do wind up requiring a vaccination, you'll want to avoid conceiving until at least one month post-MMR. Know that vaccines don't cause autism. The supposed science linking vaccines to autism has been debunked, and the lead researcher had his medical license stripped for falsifying information. Dozens of studies, along with an Institute of Medicine report, have since found zero link between autism and vaccination—MMR included.